In close consultation with our customers we will engineer customised solutions for handling, packaging and palletising as well as for picking and interlinking machines. Depending on our customer’s requirements and wishes, we can supply integrable individual systems or complete turnkey systems. It doesn’t really matter which solution our customers go for: all KOCH systems feature high reliability, optimum value for money, simple operation and maximum flexibility, in particular for any future modifications. 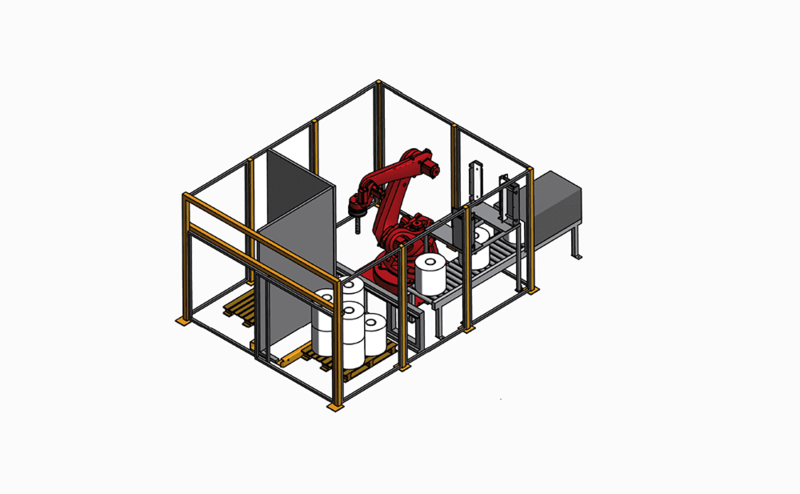 The small and versatile robot cells will help you to progressively automate your existing production lines. In addition to individual systems designed for specific applications, we also offer very reasonably priced standard palletising systems – the KOCH PalletSystems – for various types of containers and levels of performance. In our capacity as the general contractor we will take care of the entire planning, project engineering and implementation of your customised production and packaging lines for you, for instance from filling to the picked, full pallet ready for dispatch. This will free you to concentrate on your day-to-day business while we as the central contact point for all the work to be carried out coordinate the necessary interfaces – both mechanical and electrical. With our tried-and-tested gripper systems honed to perfection for all types of bags from 5 – 50 kg, we can offer you exactly the right system for any performance requirements. Our portfolio also features individual solutions for unpacking and packing bottles, canisters and similar containers as well as depalletising and palletising them. We will devise your product-specific solution – no matter whether it’s a clamping, suction or a fork gripper. Depending on the performance requirements, single, row or layer grippers are used, with robot pre-grouping as and when required. 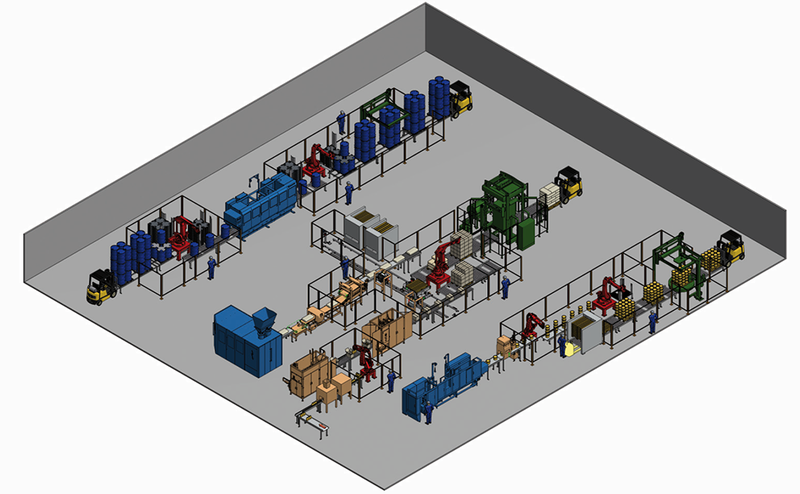 Linking several packaging lines to one robot is also possible within this set-up. Even complex stacking patterns can be created by the customer himself with our “KOCH-EasyPallet” software. Highly flexible systems for the converting industry: palletising both unpacked and packed film rolls in all sorts of dimensions, either standing or lying as desired and gripping the inside or the outside. We have successfully moved drums, cans and barrels of 60 – 200 l capacity, empty and filled. With KOCH combination grippers or exchange systems for grippers, even different types of containers can be palletised and picked by a robot with and without a change of the grippers. We can deliver exactly the right solution for hobbocks, metal and plastic pails (oval, round or rectangular) as single, row and also column palletising, and even with pre-grouping and rotary stations if required. Depalletising and palletising plastic crates and boxes with or without lids are just as much a part of our extensive portfolio as are filling and emptying them. We can provide you with the bespoke solution for your logistical requirements – including with integrated automatic crate storage as well. Concrete, wood, chamotte, clay, natural rubber, refractory mixtures, silicone etc. – even for these materials in a wide variety of shapes and sizes we can offer you the right robot system customised to your very own requirements. No matter whether you want to pack by type or mix different flowpacks, tubes or other small containers, we can provide exactly the right solution with our highly flexible robot systems. You haven’t found your product? Bespoke special-purpose systems are perfectly normal for us. We will be happy to address your specific needs for your product, sector and particular concern. In keeping with our guiding principle “Grasping more · moving more!” we will work together with you to devise individual, future-oriented solutions.